Brighton Professional Linear Low Density Can Liners provide the strength you need for heavy loads of trash. These Can Liners are made from the best prime linear low density resin offered. This can liner offers excellent strength properties while preventing punctures and tearing so there is no reason to worry about leaks. This size of can liner will fit cans from 55 gallon to 60 gallon. This fit is enough to allow overhang for closing the bag after the can is full and for easy removal without concern of leaking and spilling. Using this can liner for these can sizes help you to save money by not purchasing extra plastic. Extra plastic will end up in the landfill which is not beneficial for our environment. In addition, Brighton Professional Linear Low Density Trash Bags use a natural mineral additive which strengthens the bag while reducing the use of petroleum materials. Better for your bag and better for the environment. These liners are also created with a star-seal bottom. The star-seal bottom is the best seal ever designed for a trash bags. This seal is practically leakproof and gives you the comfort in knowing you can transport the bag without concern of dripping and staining your floor area. 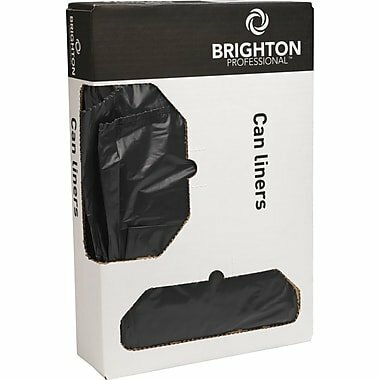 Not only are Brighton Professional Can Liners designed for these size cans, this item comes in a box that has a dual dispensing feature. Once the perforated areas are removed, you may dispense the liners from the end or, even if stacked, from the side of the container, easily and quickly. View More In Trash Bags & Liners. If you have any questions about this product by BRIGHTON PROFESSIONAL, contact us by completing and submitting the form below. If you are looking for a specif part number, please include it with your message.